Here is some information to help you know what to expect when you come to a Masterworks symphony concert. 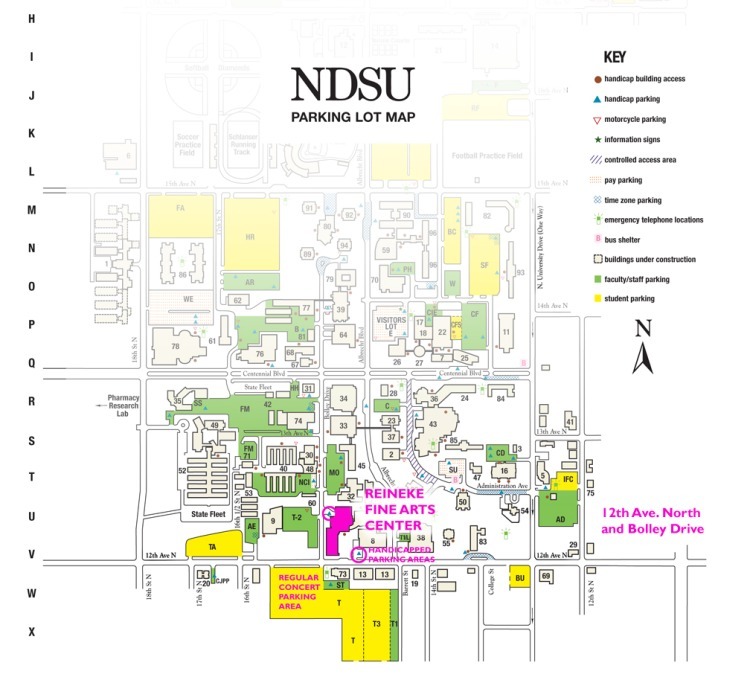 Directions and Parking: Performances are in Festival Concert Hall in the Reineke Fine Arts Center located at the intersection of 12th Ave. N and Bolley Drive in Fargo. Parking is available in the lots to the south and west of the concert hall (T1 and T2). PARKING MAP is at the bottom of this page. How do I buy tickets? The easiest thing to do is to order them online. You can also order your tickets by phone by calling the FM Symphony office at 701-478-3676 between the hours of 9:00 am and 5:00 pm, Monday through Friday. You may also drop by our offices, located at 808 3rd Avenue South, Suite 300 in Fargo, North Dakota (the third floor of the WDAY Tower). The Symphony office is closed on weekends, and no ticket orders can be taken or filled after 5:00 pm on Fridays. Tickets are also available in the concert hall lobby box office beginning one hour before concert time. What should I wear? Our best advice is to wear whatever is most comfortable for you. Some audience members opt to wear a jacket and tie or dress for Masterworks and Chamber Series concerts, but many others choose more casual wear. What you wear is much less important than your enjoyment of the performance. We look forward to welcoming you to the Symphony concert experience, whatever the wardrobe. When should I arrive? Beverage service (wine, beer, non-alcoholic beverages) is offered in the lobby beginning one hour before concert time. The informal "Informance" pre-concert talks begin 45 minutes before concert time, so it is helpful to arrive early. If you plan to buy your tickets at the door, the box office in the lobby opens one hour before concert time, and there is often a long line - please give yourself plenty of time. We try our best to begin all concerts on time. To help reduce noises in the concert hall, which distract musicians and audience members, the beginning of most performances contain a pause to accommodate the seating of late arrivals. We also permit seating in between pieces, during applause. Unfortunately, some programs have no late seating due to the structure of a particular piece of music being performed. How does beverage service work? You may now purchase wine, beer and other beverages in the lobby starting one hour before the performance. You can also pre-order a beverage before the concert and it will be ready for you at the beginning of intermission. What and when are the Informances? Music Director Christopher Zimmerman and our featured guest soloist chat about the musical program and take questions from the audience prior to each Masterworks concert. The talks begin inside Beckwith Recital Hall, directly adjacent to Festival Concert Hall, at 6:45 pm on Saturday evenings, and at 1:15 pm on Sunday afternoons, and last approximately 25 minutes, leaving time to relax and socialize before the performance. How long are concerts? Program lengths vary, but Masterworks concerts often run approximately 2 to 2 1/4 hours. Chamber concerts are usually about 90 minutes. All Masterworks concerts and most Chamber concerts include an intermission. When do I clap? Many orchestra works, particularly symphonies or concertos, have three or more sections, known as movements, each followed by a brief pause, Generally, due to a tradition that has evolved over time, audience members refrain from clapping until the end of a piece. At the concert, turn to the program page in your program book to see how many movements (often indicated by tempo markings in Italian) each piece contains. After the last movement, feel free to applaud enthusiastically! May I take photos or record the concert? Sorry, but cameras, as well as other recording devices, create major distractions for musicians and fellow audience members; therefore, no still, video or sound recording devices of any kind are permitted in the concert hall. May I bring my children to a concert? Children of an appropriate age and maturity level are welcome to enjoy the music of the Fargo-Moorhead Symphony Orchestra. Please be considerate of fellow audience members when deciding whether to bring your child to a performance. Every child, regardless of age, must have a ticket to enter the concert hall. If your child becomes restless, there is a windowed "Cry Room" at the back of the hall - please ask your usher for assistance if you would like to accompany your child into that room to enjoy the remainder of the performance (you will hear the music through a speaker but will be able to see the orchestra). Ticket Exchanges: On occasion, you may need to trade your tickets for the alternate day (Saturday for Sunday, or vice versa). This is possible, but needs to be done IN ADVANCE of the concert weekend, NOT at the concert hall. Please do not try to use the "wrong" tickets on the day of the performance. To exchange tickets, call the office at 701-478-3676 before the Friday prior to the concert weekend, and we will be happy to exchange them for seats in a comparable location for the alternate performance, based on availability. Questions at the Concert Hall: If you have questions about your tickets or seats once you arrive at the concert hall, there is a GUEST SERVICES TABLE with folks who can answer any questions you may have. Don't waste your time waiting in the Buy Tickets line, come talk to us instead. For Groups: Enjoy good music in good company. Groups of 10 or more receive discounts of 10% off regular ticket prices when arranged in advance. Call 701-478-3676 for more information. For Gift Givers: Gift certificates are available in any dollar amount and are perfect for any occasion - birthdays, anniversaries, or holidays. Gifts may be redeemed at the FMSO office, or by calling 701-478-3676.